Humans are complex, nuanced creatures capable of a wide range of emotional states, but today I want to talk about the delightful state of a bright, cheerful mood. In my mind it’s worthy to celebrate such a state whenever we come across it; but even more important I think we should dedicate ourselves to achieving it as often as possible. In truth, laughter in particular, but cheeriness in general, re-sets our energy, and there’s always room for that isn’t there? Just as we have choices about how we’ll respond to everything, I believe we can do a lot to cultivate cheerfulness. This can be a tricky topic to talk about though, because if you’re not feeling cheerful it can be easy to dismiss any attempts to achieve it as Pollyanna-ish. One of the things I often say is I like to keep my feet on the joy trail. But I think it’s important to be clear – my life is not any more magical than anyone else’s. I have my share of challenges, my share of hard, my share of sadness. I’ve known the darkness of depression deeply and intimately. I’m ordinary. But I also know that life is easier and more enjoyable when we can smile and laugh, and especially when we can hold ourselves in enough love to be able to laugh at ourselves. That’s the best! Life is many things, but it most definitely at times is absurd. What better time to laugh? Life is filled with treasures and blessings and moments of great great joy. We can meet those moments consciously with cheer, and in doing so invite more of the same in. If you can feel into that, I think you can get a sense of what I’m trying to encourage. It’s sort of holding loosely, being truly present in the moment, and staying open to all appearances of delight that you can whole-heartedly welcome. Isn’t that delicious? Seeing as how we’re all unique, we’ll of course have differing experiences about what things laetificate us. But in the spirit of sharing, and hopefully encouraging, here are a number of things that do it for me. Pretty impressive isn’t it? And the fact that I can collaborate with my Bee friends – now that’s downright amazing! I’m definitely feeling more cheerful now. One of my absolute favorites is Larry and Friends, written by Nat Jasper and illustrated by Carla Torres. It’s about Larry the American dog, and all his multi-national, multi-cultural friends who come by to celebrate his birthday. Each character has a little back story, like Rosita the Mexican Coyote, who “survive(d) the tough trip from Mexico guided by some chicken people that dared called themselves coyotes. She’s now the best luchadora in New York.” There’s Laila the Iranian Cat, and Sumita the Indian Elephant who was left behind by a traveling circus, but didn’t cry because she knew “life sometimes takes mysterious roads to land you in the right place at the right moment;” and so many other wonderful friends. This is such a delightful book about immigration, diversity, friendship and acceptance. As you’ve no doubt guessed, I love words and I definitely love word play. I really think that’s brilliant. And now I can’t stop thinking about knowledge in those terms. What’s the point of knowledge if it doesn’t move you forward on your own path? 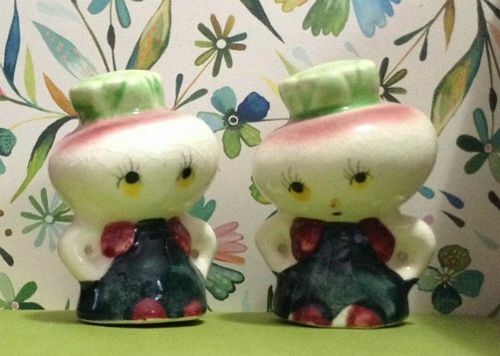 I have a collection of vintage Japanese anthropomorphic vegetable salt and pepper shakers. Apparently, for some reason I find highly veggies amusing and just looking at my collection cheers me. It’s true I may have wandered into my kitchen hunting down a piece of cheer-inducing chocolate, but stopping by and seeing these little Hankurei turnips turns up the corners of my mouth. So there you have it. We all need things in our lives that laetificate us, bringing cheer and gladdening our hearts. What about you? What cheers you? Do tell – you know I love to hear. I LOVE that phrase! I try to have a mantra that I use throughout the day, repeating it often. Today I shall borrow your phrase and engrave it on my heart. 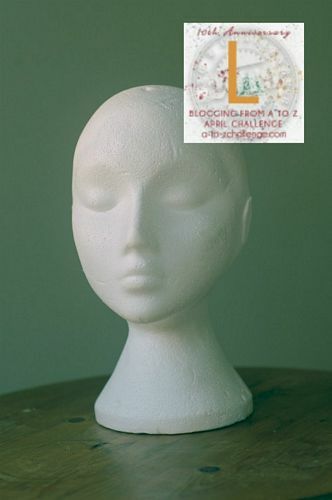 What a wonderful practice Trisha, and I’m delighted the phrase inspires you. May your joy be boundless! I’ll have to check out the books you mentioned. I love your collection of joyful things. I have some big things that make me cheerful, such as art and family, of course, but one of my little ones is eating breakfast out of blue and white Japanese bowls with beautiful patterns on them, all different… Certain pieces of music – a common laetificator for many people, although which pieces do it for each person can vary amazingly widely… The important thing is just to notice and appreciate it when it happens, to let yourself smile and be aware, “That just makes me happy!” Thanks for introducing me to a word for it. What beautiful things to have gladden your heart Anne. And I totally agree, all that is really important is that you notice and appreciate. Yes to that always! I’m going to search for your post in which you wrote about your dream and all those people or shapes were gathered … it came to me again today. I’m glad you’ve been infused with unexpected doses of cheer and joy Susan – how perfect. I think perhaps the post you’re looking for is the one I’ve written for K.
I tried the random superpower generator but even after several attempts I wasn’t happy with any of the powers it gave me. Yours is magnificent. I love the Knowledge quote and am adding that to my junk journal. I have an ornament that I keep hanging in the living room that is the word Joy in glittery letters. Lovely post. I’m sorry to hear you weren’t impressed with your randomly-generated superpowers – maybe the generator is having a cranky day and needs some cheering up. Love the idea of glittery joy dancing in your living room! Hmmm… my random superpower was terribly violent (a rocket launcher), which is not what I’d want! The sunny day promises to make me joyful. There are spring flowers blooming and seedlings sprouting. Materially, I find joy in looking at my collection of glass and ceramic insulators! They really are pretty held into the light, and smooth to the touch. It’s exciting to find one new to me in a thrift store. Finding any treasure I love in a thrift store or at a garage sale brings me a lot of pleasure. I have one watercolor (cost me just $3.00, plus a lot more for framing) on my wall I just can’t look at long enough. I don’t know why, it isn’t particularly well done. Also, a crystal wrapped in copper wire. I like holding it. It was given to me by a customer (when I worked, I’m retired now) when it fell out of her purse. I told her, and she said to keep it because she was given it, and wondered who to give it to, and it “picked” me. I didn’t understand, still don’t. But, I went with it, because, why not? I believe if you believe, sometimes that’s what matters. Like placebos! Thinking on it, peace of mind makes me happiest. When I am not concerned over upcoming bills or how my out of town children are fairing. There have been some ups and downs lately (the year started out one thing after another), and today I feel peaceful, which is cheering! I’m glad to hear you’re having a peaceful day Lisa, and yes, I agree that can be cheering. And doses of sun and Spring flowers are lovely! I like the things you’ve mentioned that bring you pleasure – how cool about your insulator collection! I’m smiling about the copper-wrapped crystal you received – I always think it’s fun to listen to when things want to be passed on and who they end up going to. It reminds me to treat the things in my caretaking as honored guests to be loved and appreciated. First of all, I love the little turnip salt-and-pepper shakers! Just looking at the photograph of them brings a smile to my face. And second–actually first and foremost–I need to lighten uo and laugh at myself more. Thank you for this post. I know – turnip smile inducers, who’d have guessed?! Here’s to lightening up and laughing at ourselves more. Thanks for stopping by Josna. I do love meeting a kindred word nerd Samantha! Wishing you a most wonderful challenge. So true! But we forget it so easily. Thank you for the reminder. A most excellent superpower Tarkabarka! What a fun and cheery post! And a lovely word –laetificate. I’m enjoying visiting your cabinet of wonders. And this post is chock full of things for me to look further into. Thanks! Thanks for the kind words Susan – and here’s to always finding wonders to explore. Today, my five-year-old grandson asked me if I knew much about a certain movie. I told him no. “it’s about happiness,” he gleefully told me. What a wonderful view he has! Those Japanese salt and pepper shakers are delightful! I don’t think that joy can be manufactured, but cheerfulness can. As a classroom teacher, I was mostly always upbeat, sometimes a pretense. Yet it helped me FEEL happier as well as giving the students a positive and caring role model. That’s the beauty of it isn’t it Margaret – we can lean into the direction of where we want to be, and it helps us shift and provides an energy others can tune into to.